Batch Assignments are a special type of assignment that allow you to bulk assign and randomly assign applications based on a reviewer:applicant or applicant:reviewer ratio determined by you. For further information about the Assignments feature in general, please see Assignments. The third option is called Batch Assignment in Select. If you know, for example, that you want each of your reviews to review 10 entries, you can set this in Select and the system will automate this for you. You can also accomplish the inverse, i.e. if you know that you want each entry to be reviewed 3 times. 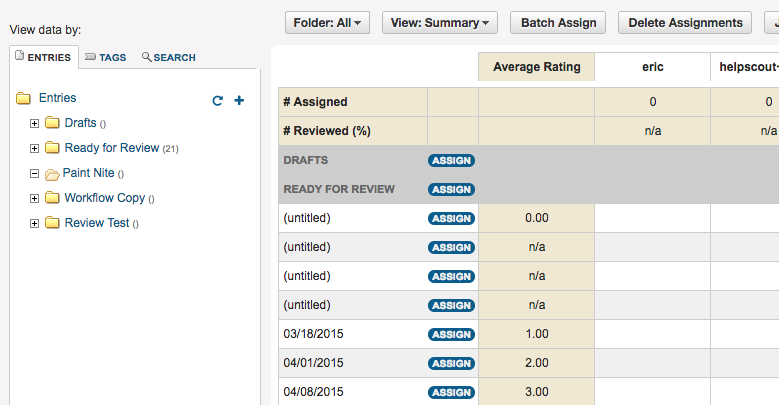 The former is called Batch Assign by Reviewer, and the latter is called Batch Assign by Entry. Each of these is covered in the sections below. 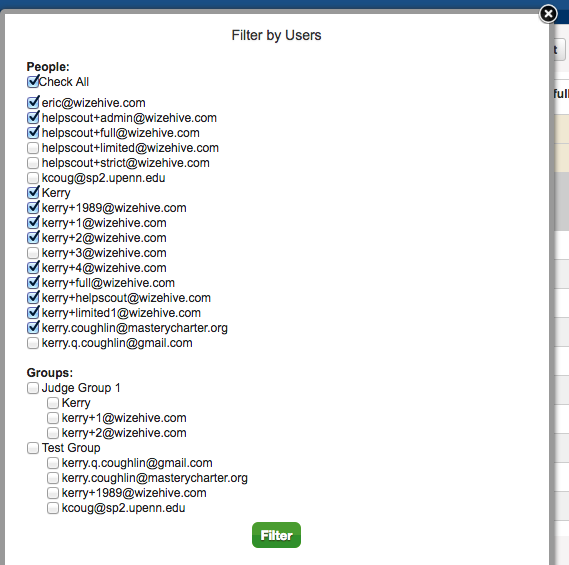 Before you automate this process, you will need to decide: which entries and which reviewers are being assigned? All of your entries should be in the same folder, as a batch assignment is performed based on a folder. In the example we will be utilizing, the Ready for Review folder will be assigned, and all entries have been moved to this folder. If a select group of your reviewers will be doing this part of the judging, then you will need to filter on those judges before you trigger the batch assignment. This can be accomplished on the Judge Filter button of the Assignments tab. You will this screen, with the usernames of all of your reviewers. Please check off the ones who will be reviewing in the batch assignment you are about you set up. Once this step is done, you are ready to set up the batch assignment. From your main assignments screen, click the Batch Assign button. First, you will select your Folder. In this example, it's Ready For Review. We are assigning all entries in the Ready for Review folder. Next, you will select whether you are assigning by Reviewer or by Entry. Assign by Reviewer: Batch assigning by reviewer means you know how many entries you want each reviewer to review. E.g. you want each reviewer to review 10 applications. Assign by Entry: Batch assigning by entry means that you know how many times you want each entry or application to be reviewed. E.g. you want each application to be reviewed 3 times. Example 1: You are assigning by reviewer and assigning each reviewer to 10 applications. In this scenario, you will select Assign by Reviewer. In Entries Per Reviewer, put 10. Example 2: You are assigning each entry to be reviewed 3 times. In this scenario, you will select Assign by Entry. In Reviewers Per Entry, put 3. Once you are ready, click Assign. The system will take a few minutes to process your request, and you should navigate away from the Assignments tab and back in order to see the results. The results of Scenario 2 will look like this - the assignments (the red dots) have been dispersed randomly across reviewers and entries.